An eye catching & attractive landing page elementor template for tourism or niches. But as similar to our other templates this can easily be adopted to any niche. 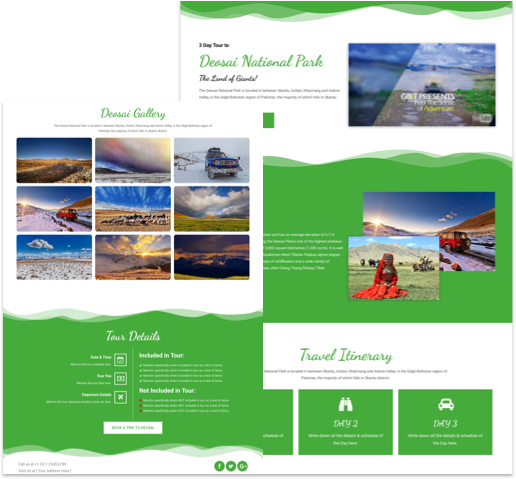 This is an eye catching & attractive elementor template for tourism and related niches. 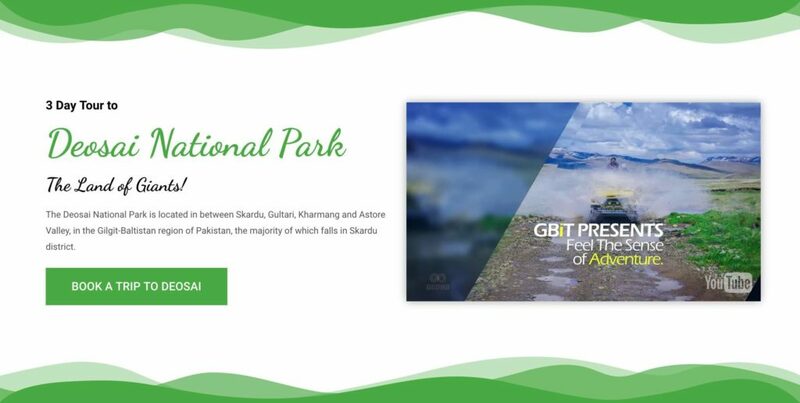 The green color scheme used is mainly to represent Pakistan as the demo uses an attraction from Pakistan, you may however change the color scheme to your desired one easily via the elementor page builder. This template doesn’t use any pro element and is purely done using the free version of elementor page builder. However you may look into the features of Elementor Pro here. The hero section is built on 2 column layout with white background to make the content prominent and uses a intro video on the right. Than this templates utilizes the elementor’s shape divider feature on top and bottom to add a nice look to the section. This section blend with the above section by continuing the background color. Here you may explain a bit about the tour or about the attractions to the visitor with the help of content & imagery. This section uses a solid background color only with no other settings. A simple section which explain the visitor your tour plan & schedule. This section uses white background and for demo it is showing a 3 day details using 3 column grid and with the help of icon box module. But if you will have longer tour you may add more column and even continue it to another row of columns. 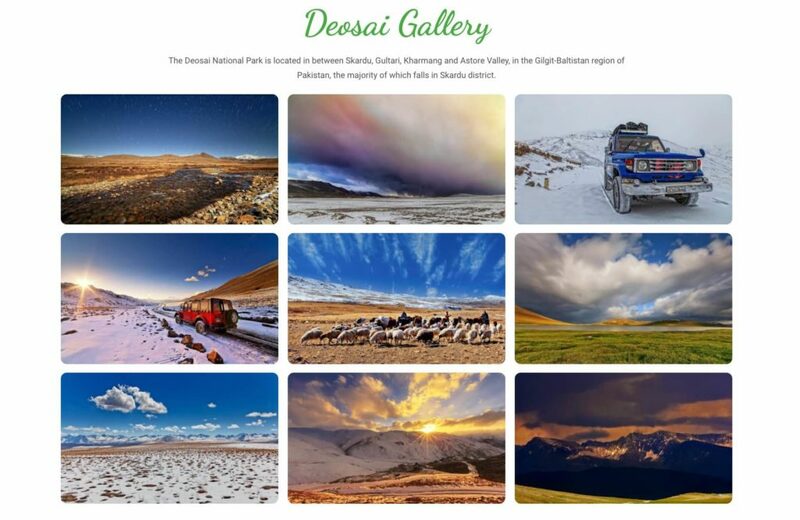 A simple gallery section with white background and no other setting. Using the elementor’s gallery module with 3 column layout. You may customize it based on you liking and the number of images you like to showcase here. This is a 2 column section using a solid background color and shape divider on top & bottom. 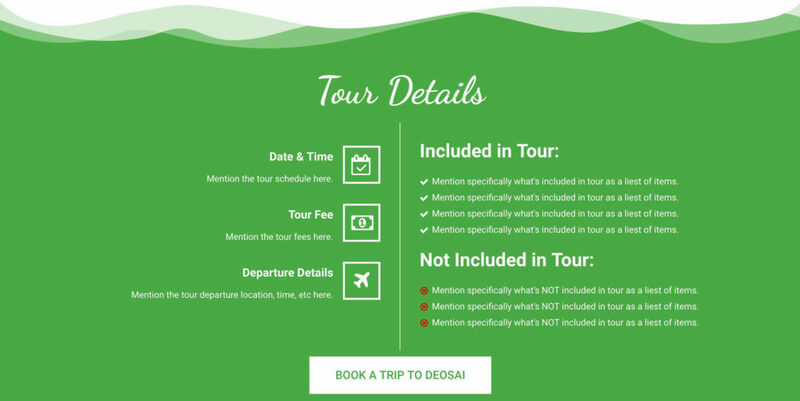 here you may provide all the necessary details related to this tour like pricing, date, time, what’s included and what’s not, etc. Last section is a simple 2 column layout with white background and nothing else the shape divider you see in screenshot is from the above section. Here you may put your contact details and social links, etc.